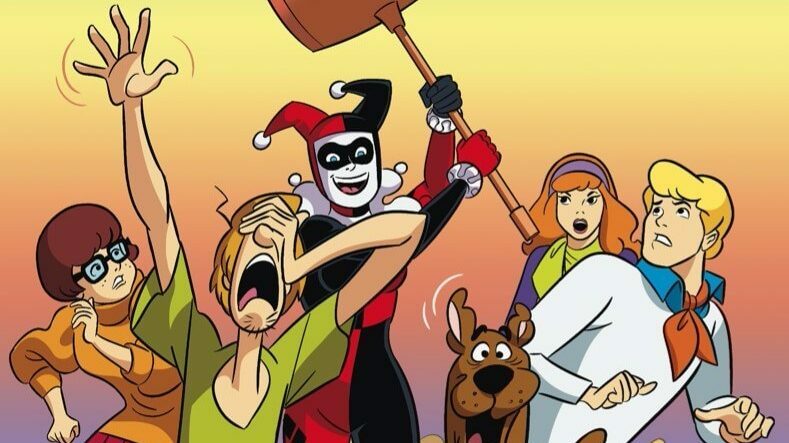 What current DC and Marvel comics are aimed at kids? Marvel’s announced that they plan to license out their characters to comics publisher IDW. IDW will produce a line of kid-friendly monthly single-issue comics and trade paperbacks starring Spider-Man (Peter Parker and Miles Morales versions), Black Panther, and others. While IDW has a strong record of producing licensed property comics, Comics Beat notes it’s still an example of one of the biggest comic publishers not getting directly involved in the growing kids’ comic space. People on my Twitter feed, plus the various comics blogs/news sites, have been discussing why Marvel’s made this decision. Why can’t DC and Marvel offer more kid-friendly comics? 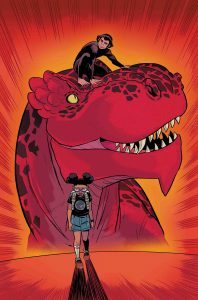 “Moon Girl and Devil Dinosaur #23.” Art by Natacha Bustos. Below are some of my guesses why the Big Two seem indifferent about targeting kids. For starters, Marvel, like DC, see their canonical superhero books as primarily aimed at older readers. Never mind most of DC and Marvel’s popular heroes were created with kids (or an all ages audience) in mind. Most Big Two superhero comics also aren’t kid-friendly in content or price. Parents aren’t going to pay for a “Batman” comic featuring the Joker committing gory shock-violence kill sprees. Nor will kids (or their parents) “stick around” for dozens of issues (and crossovers/tie-ins) at $4 apiece to see how a storyline plays out. (The headline for this Entertainment Weekly article on “Batman” #50 says it all.) And of course there’s the soap opera-level impenetrable continuity (and reboots, etc.) that’ll turn kids (and plenty of adults) off cold. Marvel’s trade paperback and graphic novel presence has also been weaker than DC’s. Checking Comichron’s trade paperback sales estimates for 2017, Marvel doesn’t put in very many entries in the top 50 trade sales, including none in the top 10 trades sold. On top of that, Marvel also licenses out kid-friendly comic lines (the Disney Duck comics, a line of Marvel digests (now cancelled), etc.) for other publishers to handle. Of course, there’s an explosion in independent and smaller publisher kids’ comics right now. But still, what kid-friendly comics do the Big Two themselves currently publish? Yes, I said “currently”—both companies have had various older kids’ lines, but I wanted to look at what’s currently being offered. Despite the aforementioned remarks about its mainstream DCU books, DC has put in the bigger effort out of the Big Two (such as it is) in trying to appeal to kids. And that’s it. Of course, the above books are also collected as trade paperbacks. DC’s “DC Super Hero Girls” line has proved popular, even topping the company’s graphic novel sales in the direct market. DC Zoom: a line of graphic novels for readers ages 8-12. DC Ink: a line of graphic novels for readers ages 13+. Both lines will launch in the spring of 2019. The lines were originally planned to launch later this year, but they’ve been pushed back. A reprint of 1961’s “Fantastic Four” #1. “Marvel Super Hero Adventures: Inferno” #1 (a one-shot). “Marvel Rising: Ms. Marvel/Squirrel Girl” is also out this month, tying into the upcoming Disney XD animated series starring the two heroes. However, this book’s rated “T+”—the same rating a Marvel Universe Wolverine or Venom outing might get. Assuming it’s not a typo, that seems at odds with the point of the line. “Venom Adventures Digest,” featuring reprints of Venom’s adventures in the former “Marvel Adventures” all-ages line. Otherwise, Marvel’s graphic novel plans are as announced—a line of kid-oriented books available through IDW, not Marvel-proper. That’s in addition to other Disney properties available through IDW, namely the Disney books (“Uncle Scrooge,” “Mickey Mouse,” an adaption of the current “DuckTales” TV series). 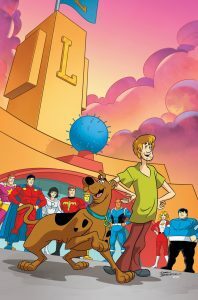 The Big Two offer a few kid-friendly comics, and there’s plenty of trade paperback reprints of older material (such as the comics based on “Batman: The Animated Series” or “Teen Titans”). However, if kids are OK with genres besides superheroes, independent creators and smaller publishers offer a broad range of material. Next Post:What were the main influences and trends in 1980s TV animation?